If you travel abroad, “attractive unattractive americans” is worth a look. American travelers trying to pass themselves off as Canadians is an old story. 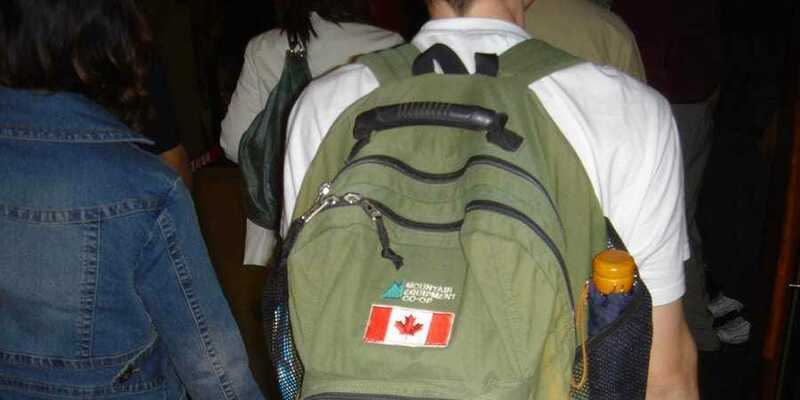 I’ve seen them with Canadian flags sewn onto their backpacks – but I haven’t heard them going so far as to claim to be from Moose Jaw or pepper their speech with an “eh” every few sentences. That’s because there’s still a perception that the world doesn’t like Americans – that people from other countries think we’re loud, impolite and dumb. Author René Zografos tries to get a handle on this in his book attractive unattractive americans: how the world sees america. I should mention a little problem up front: Some people from the Americas might have a problem with the title. As a friend from Brazil likes to say, he’s an American, too. I see his point, so I would’ve called it how the world sees the united states. A Canadian, or a faux-Canadian? Zografos – who has an interesting half-Greek, half-Norwegian background – sets an interesting and nearly impossible task for himself here. He seems like the kind of guy who’s a great conversationalist. You’d want to run into him in a bar or a cafe and hang out with him. He clearly is good at getting people to chat with him, and at preserving the essence of what they say. People from a long list of countries gave Zografos their thoughts on the United States and its people. Ultimately, I can’t see any clear-cut conclusion. I didn’t really expect him to reach one, though. I just expected to be entertained by the journey. I also expected a few surprises along the way. Well, the people Zografos interviewed delivered. I was particularly shocked by some of the sweeping generalizations. More than a few people wrote off everything about the United States and rejected the possibility that there’s anything good about it – crude pursuit of wealth, crude language, crude dress (one person painted a picture of the entire United States running around with its pants collectively sagged). I completely expected the United States to take its lumps in this book. I didn’t expect some of the criticism I saw, but I expected a good bit of it. I really enjoyed how one person skewered how the U.S. is addicted to superlatives – we love everything and think everything is awesome. And yes, we’re definitely way too oblivious to what’s happening in other countries. Scandinavian and Nordic seem to think they’re cold and unfriendly. That’s their perception of themselves. Well, my Scandinavian and Nordic friends, this visitor doesn’t think so at all. From Iceland to Finland, people started conversations with me. They were quick to help with directions. Maybe they’re not as ebullient as Australians … they’re more chill and relaxed. But they’re still genuinely nice. I have nothing but good to say about Scandinavian and Nordic people. Speaking of friendliness, people from the U.S. have a reputation for friendliness. Some of the people interviewed for attractive unattractive americans accurately perceived that much of it is reflexive but insincere politeness rather than friendliness. I could probably write a book that deconstructs American friendliness for what it really is. That’s not to say we don’t have genuinely friendly people. But they’re the exception. There’s also a perception that the United States is optimistic. I definitely question this. There was a time when each generation was expected to be more prosperous than the previous generation. Those days are over in the United States, and we know it. We lag behind the rest of the world in health care and paid time off (sick leave, vacation time, etc.). More of us work part-time and are mired in student debt. We’re over-caffeinated, overworked, overfed and over-tired. So, what reason do we really have to be optimistic? Overall, I had fun reading attractive unattractive americans. I think future editions could use some improvement, though. One of my big quibbles is the book’s organization. I’d get into the flow and just be reading and reading … and I’d lose track of who’s speaking. Between long interviews and short quotes from people he’s met, Zografos interjects with some ideas and opinions of his own. Sometimes, I had to backtrack a few pages because those transitions could be far more effective. That could be a design issue in the book’s layout. But it could also be solved with the author making a better effort to craft a more distinct voice. If you travel, attractive unattractive americans is worth a look. It might help you realize a few things about yourself and your home country, and I see some learning opportunities that will help you connect with people you meet when you travel. And that is true no matter where you’re from. I hope all is well. When I was in Australia back in 1999, the people there seemed to love us Americans. I’m not sure how much has changed since then. Much of the world has changed since then.